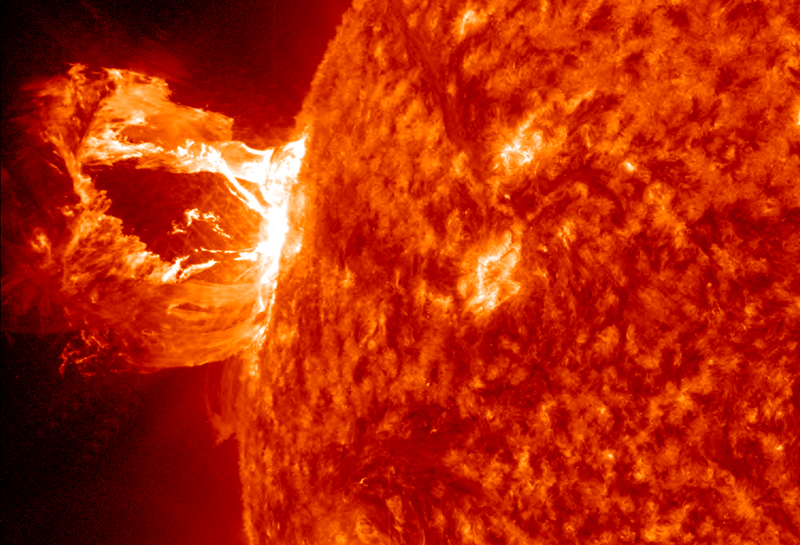 Solar flares continually erupt from the surface of the sun. These powerful surges of plasma can reach the earths magnetic field. The number of flares and sunspots fluctuate each year reaching a maximum every approximate eleven years. The Sun was due to reach a solar maximum in its 11 year cycle in 2011 or 2012. The current solar maximum was expected to be less severe than normal, however recent observations suggest that the maximum will now be delayed and occur in 2013 and be 40-50% stronger than the last maximum in 2001. A recent article published in the New Scientist and based on a report by NASA and the National Academy of Science suggests that a massive solar flare could cause serious damage to the electrical power grid in the USA. Such a massive solar storm is called a “Carrington Event” after Richard Carrington who viewed and reported on a major solar flare that occurred in the mid 19th Century. From August 28th through September 4th, 1859, a series of northern lights or aurorae borealis which were unusually spectacular were observed throughout the northern hemisphere. The lights were actually seen as far south as Hawaii, the Caribbean, and Central America. The event had little impact on the world of the time, but did cause serious damage to telegraph lines across the US. A Carrington Event in 2018? Could such an event happen today and what would be its impact? It is likely that the electrical activity in polar regions could drive large currents in the electrical grids causing large-scale and possibly long-term damage. In reality, there is some warning given by instruments based on two satellites, Twins 1 & 2, a pair United States National Reconnaissance Office satellites. The Twins carry instruments that measure the flux of neutral particles and Lyman alpha photons. These particles indicate a disturbance of the geocorona around the earth consistent with a Carrington event. They would give a short-term warning measured in hours rather than days and might allow the grid operators to shut down systems in keys areas and prevent excessive damage. NASA appears to be sufficiently concerned that it is launching the “Solar Dynamics Observatory” which will study the sun in unprecedented detail. This should improve our understanding and ability to react to any threat. It is not possible to predict with certainty when the next Carrington event will occur but a recent report based on modelling of the sun has determined a 12% probability that such an event will happen in the next decade. Chances are we will avoid such a catastrophe but it is hard to ignore such a high risk which could result in huge loss of life as outlined in the New Scientist article. We are deploying instruments to monitor the suns activities and resources to model the sun and with a little luck we can avoid the worst case scenario. But we must commend the foresight of those that warn us of the potential for harm from our normally friendly neighbor.